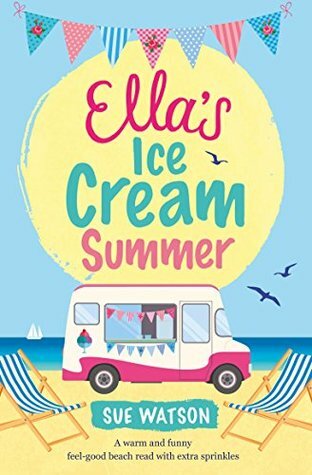 We all know I am a sucker for a sweet book, and could Ella's Ice Cream Summer come along at a better time? Nope, I think not. Life hasn't been too great for Ella - when she loses her job, her children fly the nest for the summer and her home is days away from no longer been hers, it seems the opportunity has come knocking. So, she heads off to the coast with a newly acquired pooch in tow. What she receives on arrival is not what she expected, well not really - she knew what she was getting into but well, a run down ice cream van wasn't going to fix her life was it? Ella's Ice Cream Summer is a sugary sweet dose of traditional Italian Ice Cream mixed with the sour taste of secrets that could change a lot of peoples lives. Sue has once again created a wonderful community that is built on family and tradition, mixed with the challenges of modern day family feuds. Throw in a sea salt hearted Solicitor who belongs in the water and has a refreshing look on everything and maybe, things might just get better. This was a read that I flew through, had me craving all the ice cream and visiting the coast to feel the sand between my toes and sea salt in my hair. Even on the cold days, Sue has created a place that you still warms the soul. I really felt attached to Ella, there was just this part of her that made you want to root for her, that felt she deserved more and that she should get the happy ending she deserved. Ella was the soul and heart of this book, but we can't review this without mentioning her mum and the pure laughter she extracted from her as she started to learn the internet, and the meaning of sexting. The legacy Ella's aunt left behind is also something I feel that should be mentioned, and something that was written so beautifully that it's hard to remember that it's not real. A wonderfully written dose of sugar sweet for the summer. Sue Watson was a TV Producer with the BBC who combined motherhood and family life with a busy career. However, one day it dawned on Sue that Cosmo magazine may have been telling porkies about 'having it all,' and her life had become a slightly crazed juggling act. So after much soul searching (and comfort eating) Sue abandoned her TV career, bought a pink laptop and wrote a novel. 'Fat Girls and Fairy Cakes,' tells the story of Stella Weston, whose life is a constant struggle with a nasty boss at work, the weighing scales and being a mum, wife and daughter. Originally from Manchester, Sue now lives with her husband and teenage daughter in Worcestershire. When she's not toiling over her latest novel, Sue bakes (and eats) cake and enjoys very large tubs of Caramel Chew Chew ice cream all to herself while watching 'The Biggest Loser USA.' Sue's second book, 'Younger, Thinner, Blonder' was released in October (2013) and her third book 'Love, Lies and Lemon Cake' is released on June 27th 2014.